The next decade proved to be the most successful period in the clubs history. They were nationally recognised as one of the best clubs in the country and their rivalry with local neighbours, Bishop Auckland intensified. Millfield had seen more development with terracing being put behind one of the goals and to the side of the main stand. In the 1955/56 season the FA Cup was again a source of great excitement in the town. 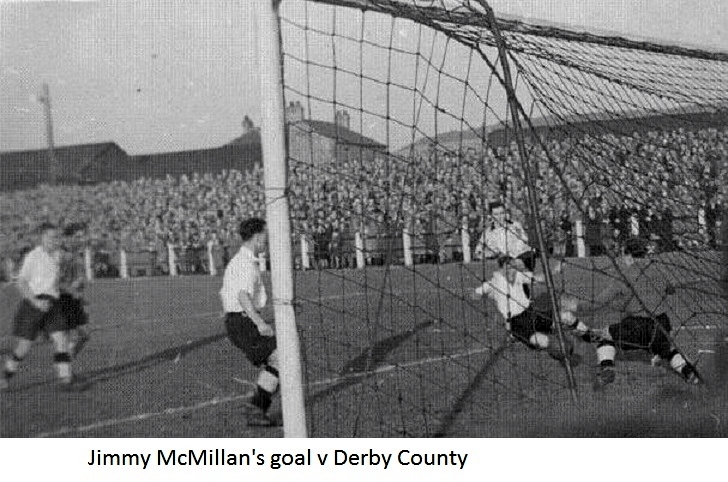 On 19th November 1955 Derby County were the visitors to Millfield in the 1st round proper. In an amazing game Crook came back from 2-0 down to force a draw 2-2 against their football League opposition. In fact if it had not been for a missed penalty by Crook skipper Bobby Davison Crook would have taken the victory. During the game, former England centre forward, Jesse Pye, rocketed a 30 yard shot off the Crook crossbar. The cross bar had to be replaced after the game due to a crack from the force of the shot. That cross bar is still kept under the main stand to this day. Unfortunately Crook could not match that performance and in the replay at the Baseball Ground they went down 4-0. The rivalry between Crook and Bishops was now not only to be the best team in the Northern League but the best in the country. In a 4th Round Amateur cup match in 1957, A total of 24,000 fans watched Crook lose out in a replay over two games. The 1957/58 season again brought a good run in the FA Cup with Crook again reaching the 1st round proper. Unfortunately things did not go to plan and they crashed out 8-1 at Workington. 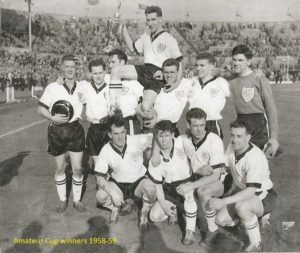 In 1957/58 Crook reached the semi final of the Amateur Cup. 19,000 fans watch Crook dominate Ilford for long periods of the game and the writing seemed to be on the wall when Crook missed a penalty. Indeed it was as in a rare breakaway Ilford scored to win the tie 1-0 and progress to the final leaving a lot of Crook fans bitterly disappointed. 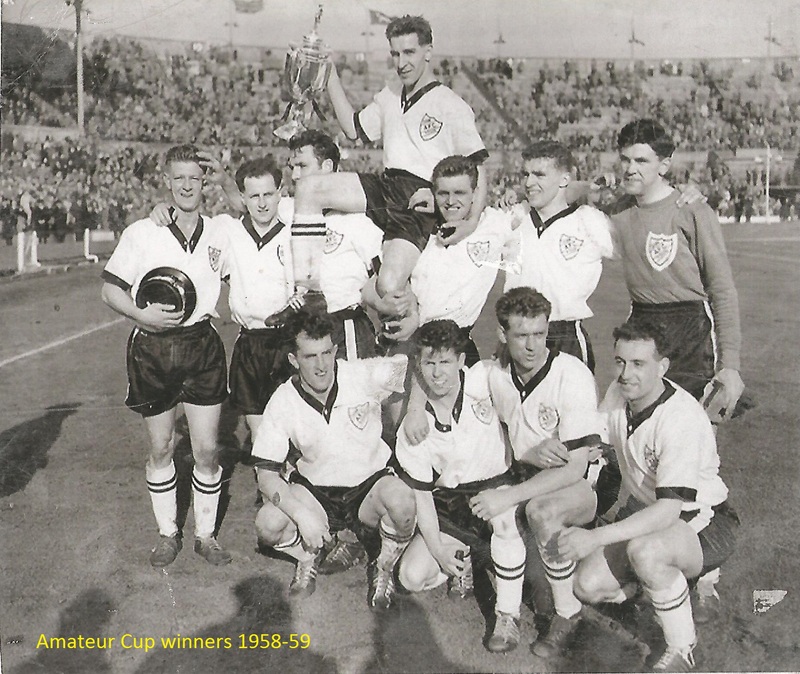 The 1958/59 season, Bishop were going for an unprecedented consecutive 4 Amateur cup wins. However, it was Crook who were to contest the final at Wembley stadium that year against Barnet. On the 18th April 1959 Crook once again lifted the Amateur cup after a 3-2 victory against their outplayed opponents. The club was now going from strength to strength as the supporters club now had a membership of over 1,000 people. In their defence of the Amateur Cup Crook made it all the way to the semi finals where they faced Kingstonian at St James’s Park, Newcastle. With score poised at 1-1 Crook seemed to score the decisive goal but the referee adjudged that the ball had not crossed the line. Kingstonian spurred on by their good fortune went up the other end and scored what proved to be the winning goal. Crooks consolation that season saw them beat West Auckland in the Durham Challenge Cup Final. The 1960/61 season was one of disappointments with Crook having set their standards so high in previous seasons. One highlight saw Crook lift the League Cup defeating the old enemy Bishop Auckland 2-0 in the final. 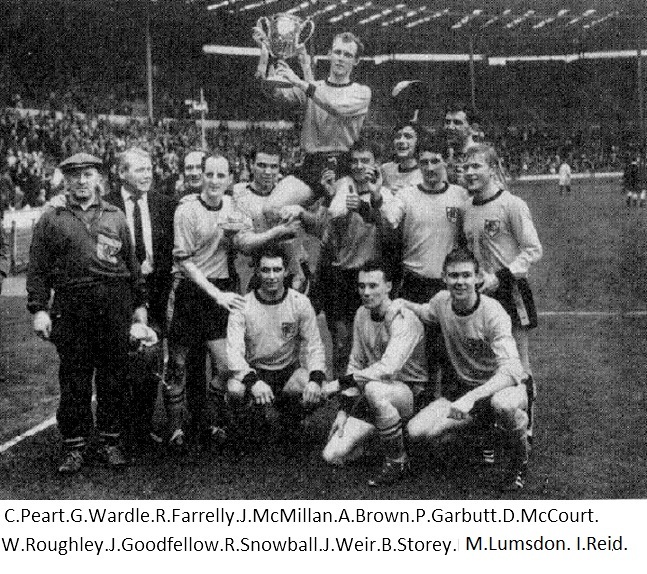 1961/12 proved to be another fantastic season for Crook. 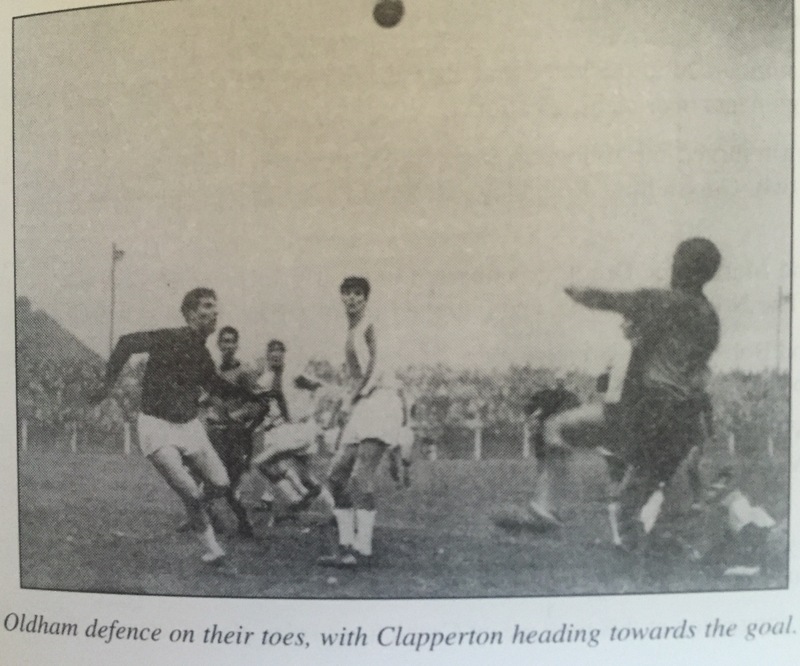 They again reached Wembley Stadium in the final of the Amateur Cup their opponents being Hounslow. A poor game ensued littered with mistakes and disjointed play with the final result being a 1-1 draw. 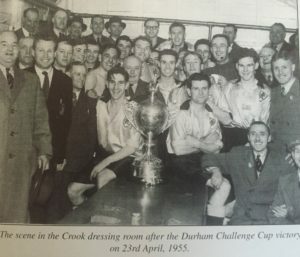 However, in the replay at Ayresome Park Crook got their act together and outclassed their opponents to lift the Amateur Cup for the fourth time with a 4-0 victory. 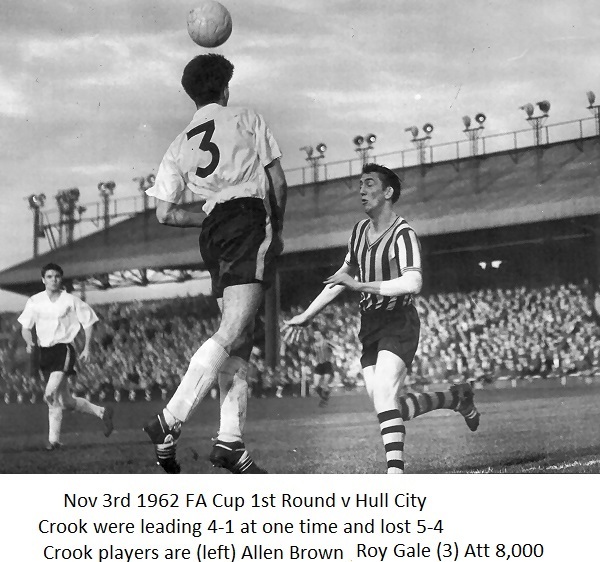 In 1962/63 Crook were once again on the FA Cup trail and in a remarkable game against Hull City with Crook leading at one stage 4-1 Hull staged the fight back of all fight backs to win the game 5-4 and send Crook crashing out of the competition to the huge disappointment of players and fans alike. Success again was only just round the corner as Crook finished the season as Northern League champions but lost heavily in the League Cup final 4-0 to West Auckland. This could be attributed to playing 6 games in 9 days in the run up to the final. The 1963/64 season again proved to be one of great success for the club. 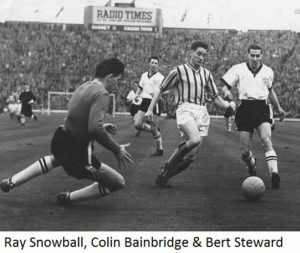 Firstly, the club again reached the 1st round of the FA Cup being drawn at home to Chesterfield but lost out in a close fought game to their football League opponents. Success again proved to be just around the corner as Crook again made the Amateur Cup final at Wembley Stadium. Their opponents this time around were Enfield. In an end to end game Crook eventually lifted the trophy for the 5th time with a 2-1 victory. This was to be Crooks last appearance in am Amateur Cup final up to the completion being disbanded in 1974. 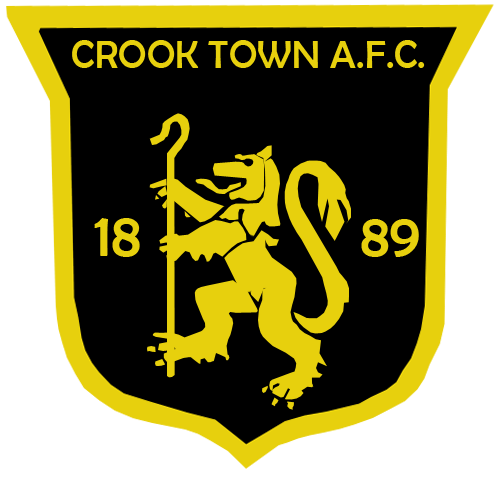 Crook player Jimmy McMillan remains to this day the only player ever to win 4 Amateur Cup Medals with all of them being won in the Black and Amber colours of Crook Town. In the same season Crook lost out in the league by a solitary point. The 1964/65 season once again saw Crook blazing the FA Cup trail which saw football League opponents Carlisle United being the visitors to the Millfield in the 1st round proper. On the 14th November 1964 a healthy crowd watched Crook put in a scintillating display and run out 1-0 winners to be in the draw for the 2nd round. Their 2nd round opponents were Oldham Athletic another football League side and after another hard fought game Crook this time ended with a 1-0 reverse to go out of the competition. Another disappointment for Crook saw them again miss out on the league title by a solitary point and in a season of disappointments they also lost in the Durham Challenge Cup Final going down 2-1 to West Auckland.